Following her spectacular performance at last night's Super Bowl half-time show, Beyoncé has announced plans for a new world tour, which includes several UK and Ireland arena shows scheduled to take place in April and May of this year. Beyoncé's latest concert tour will be known as The Mrs Carter Show World Tour - in reference to her married name. The tour will begin in mainland Europe, with shows planned for Serbia, Croatia, Slovakia, Holland and France, before it crosses the channel to the UK in April. 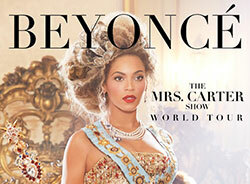 Tickets for the UK dates on The Mrs Carter Show World Tour will go on general sale at 9:30am on Saturday 23rd February. Tickets for the Dublin dates go on sale at 9am on Monday 11th February. There will also be a pre-sale for members of Beyoncé's Beyhive Blog, which fans can join for free at www.beyonce.com.